Google Cloud Platform has been racing to improve its positioning in the cloud industry. The late start has allowed Microsoft and Amazon to build a huge lead around functionalities, services and even the number of datacenters that are available for their cloud infrastructure business. But Google has picked up speed, making several important announcements in the last twelve months around Google Cloud Platform. Yesterday, Google announced that the number of CDN’s (Content Delivery Network) available for Google Cloud users has risen to eight providers. CDNs, or Content Delivery Networks, play a crucial role in delivering content to users because they increase performance and reduce latency. Google launched its own Google Cloud CDN in December, 2015, weeks after partnering with Akamai, one of the largest content delivery networks in the world. Clearly, from the start, Google wanted to bring in multiple CDN provider’s while also building its own network. 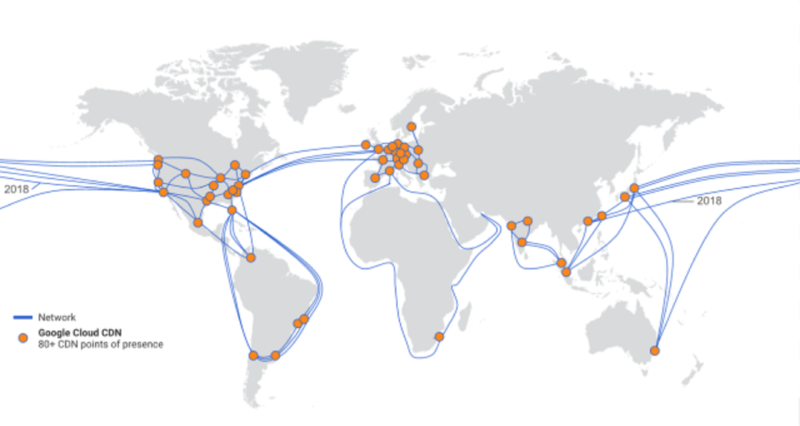 Google users can access select content delivery networks such as Akamai, Cloudflare and Highwinds through what the company calls the CDN Interconnect program. “The CDN Interconnect program provides choice and depth to Google Cloud customers. It allows select CDN providers to establish direct interconnect links so that customers egressing network traffic from GCP through one of these links can benefit from the direct connectivity to the CDN providers as well as Interconnect pricing,” Google says in its blog post. In comparison, Amazon Web Services has preferred to use its own CDN, Amazon CloudFront. Microsoft Azure supports CDN providers like Akamai and Verizon, while Google has chosen to expand inorganically and include seven other providers to form a much larger content distribution solution. While we could debate the merits and demerits of a single-vendor solution like Amazon’s, as opposed to Google’s multi-vendor one, it’s good to see Google form strong partnerships with domain experts; more so because Google itself is an expert at facilitating content delivery across the globe. But this network of CDNs will allow Google to offer greater capacity, lower latency for more regions and several other benefits to Google Cloud Platform clients. And all of them are highly marketable commodities.